Changing your schedule starting day allows you to customise your scheduling page. To change the starting day of the schedule you must be either a Location Manager for that location or a System Administrator. First, please click “Locations” at the top of the screen. You will see a list of your locations displayed. On the right of the location you’d like to edit, please click “Settings”. On the next page, please click “Scheduling” on the left hand side. At the top of the list of options you will see “Week Starts With”. Please change this to the day you want the schedule to start from for the selected location. After changing the day, please click “Save” at the top of the screen. Please note that different locations must have different starting days, however to use the “All Locations” view of the Schedule you will need all locations to use the same starting day. 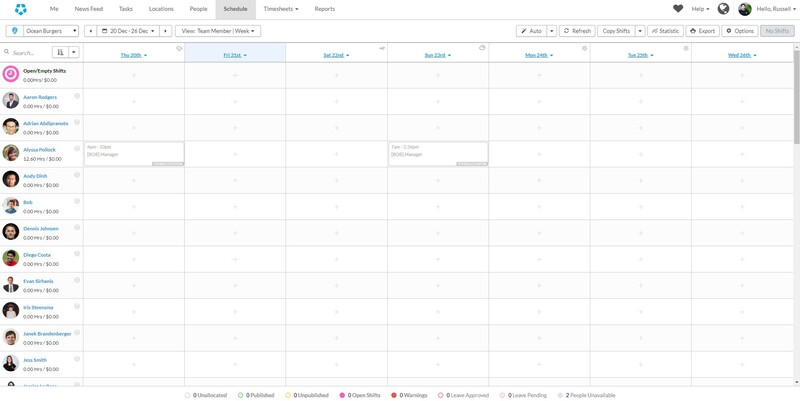 In the example below, the location 'Ocean Burgers' has had it's starting day changed to Thursday, which displays Thursday in the first column in the Weekly scheduling view.